What were you doing this ‘Cinco De Mayo‘? Well, it was a bank holiday here, so as the weather was nice you were probably indulging in some alfresco festivities. But did you know that the 5th of May is a widely-celebrated holiday on the other side of the pond? Perhaps you knew all about Cinco de Mayo and were ready to party, sombrero in hand; more likely, you had no idea it existed, much like me until last week. Well, if you fall into the latter category please allow me, with the help of my good friend Mr. Google, to enlighten you. Cinco de Mayo is celebrated on… you guessed it, 5th of May! 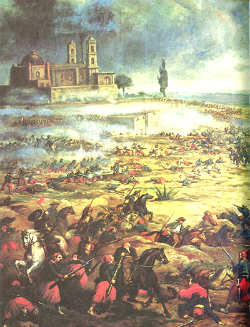 The Cinco De Mayo festivities commemorate the unlikely David and Goliath defeat of the French Army by Mexican forces in the nineteenth century. The event is celebrated in the United States and in some regions of Mexico, predominantly in the town of Puebla, where the battle took place. After a succession of wars including the Mexican-American war (1846-48) and the Mexican Civil War (1858), Mexico was left nearly bankrupt and saddled with large outstanding debts to France, Spain and Britain. As a means to stabilise the economy, in 1861 President Benito Juarez suspended all foreign debt payments for 2 years, much to the chagrin of the country’s European creditors. In response, a combined Naval taskforce (as it would be called now) from all three countries swarmed to the city of Veracruz to get their money back. On discovering that France was plotting to incorporate Mexico into her empire, however, the British and Spanish negotiated with Mexico and withdrew their fleets. Napoleon III however, was determined to start setting up a French-favouring Latin Empire and pressed on with the invasion. After storming Veracruz, sending El Presidente into retreat, around 8000 heavily-armed French troops made their way deeper into Mexico. En route to Mexico City they encountered great resistance from the Mexican people, and at the town of Puebla on 5th May 1862 they met with a Mexican army of around 4500 souls, most of whom were relatively ill-equipped. Despite their limitations, the Mexicans, under General Ignacio Zaragoza Seguin, kicked some serious French culo and the French army suffered their first defeat for 46 years. The victory was short lived, however, and within a year the French had taken Mexico City and Emperor Maximilian of Austria was appointed by Napoleon to the Mexican throne. 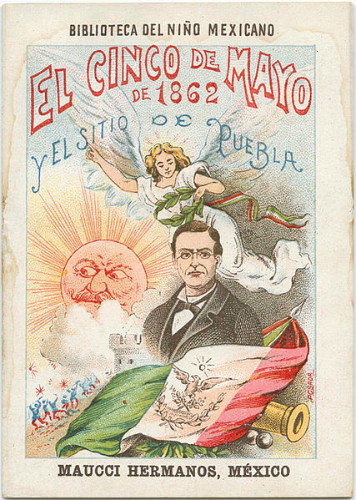 But regardless of the eventual defeat, the 5th May victory at Puebla revitalised Mexican patriotic pride and improved morale among both the army and the citizenship after the damage to national unity caused by the civil war. It was a victory for the underdogs, a unification of a country’s people to fight a larger cause. Let me first relay a few facts about Mezcal and Tequila to clear up any confusion. Although hundreds of varieties of agave exist, Tequila can only be made with the Blue Agave (Weber) plant. Mezcal can be made with any of around thirty different varieties of agave. Laws of designated origin now state that both tequila and mezcal must be made in specified areas throughout Mexico to be called by these names. The vast majority of mezcals are made in the state of Oaxaca. 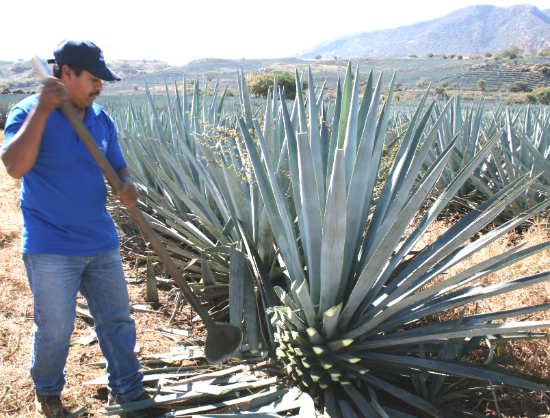 In comparison to the industrial operations farming blue agave for most tequila production, the agaves used for mezcal are often more scattered, and are frequently harvested from the wild by artisanal producers. If you have never seen an Agave plant, think of Sideshow Bob from the Simpsons – they resemble enormous pineapples growing on the ground with large, spiky leaves sprouting all over them. These leaves are cleaved off by highly-skilled local jimadors using a lethal long blade called a coa, and the remaining head or ‘piña’ is the part collected for the production process. Agave for tequila production is often cultivated in long uniform lines waiting to be harvested. Mezcal has a much more natural feel to it. Agaves are collected from the desert and are often hard to access and collect. The piña is then roasted in clay pits, or ovens for up to 4-7 days, giving it the smokey, earthy notes common to mezcals. A large granite rock called a tahona is then rolled over the cooked agave, which now lies in a pit, cracking it open to release the sugary juice inside. Think of a large maraca being pulled around in circles from a fixed point, by a donkey…if you can. Water and yeast are then added to start fermentation, either in the pit or in large vats. The mash (or wort) will be scooped out of the pit using buckets (and possibly a few local children). So when ready to distil, the wort may still contain chunks of the cooked piña. Sometimes only wild, airborne yeasts are used, meaning fermentation can take up to 30 days. After fermentation the wort is then pot-distilled either once or twice in copper, clay or porcelain stills. Stepping up to guide us through the first two spirits was Mr Philip Wilson of importers Marussia Beverages. Taking us through his own personal journey of Mexico, the tasting was conducted with a very informal ‘feel free to take a sip and sniff, while you listen’ affair. A bowl of tortilla chips lay in the centre of the table being eyed up by the tasters as we removed the watch glass from our first samples. For Phil’s tasting we were talking about Sotol, one of Mexico’s least well-known agave spirits. Sotol is made mostly in the state of Chihuahua and can only be produced from the sotol plant, aka (brilliantly) the Desert Spoon, an agave-like shrub of the Nolinoideae family that was until recently considered part of the agave family. It has an air of mystery about it, due to the time it takes for the sotol plant to mature (15 years), the amount of spirit produced by each plant (1 bottle) and the difficulty encountered by the jimadors trying to access the plant (very hard). Sotol is all about elegance, and Hacienda de Chihuahua is distilled in a long-necked pot still (34ft tall) to produce a light, elegant spirit. Nose: Floral, herbal nose, peppery spice and sweetness. 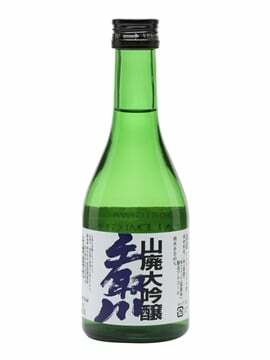 Palate: Strong vegetal earthy notes, uncooked root veg, oak and citrus with a spicy finish. Nose: Vanilla, caramel with that raw vegetal note from the cooked agave, slight smoke. 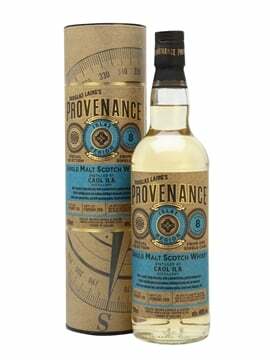 Palate: Fuller mouth feel, fruit and herbal notes, caramel, pepper and vanilla, warm lingering finish. Now we moved onto the Ilegal (ill-e-ghal) mezcal. It all started when John Rexer began smuggling Mezcal from Oaxaca in Mexico to his bar Cafe No Se in Antigua, Guatemala. With growing demand, the trips became more frequent, with bigger loads being carried in anything John and his colleague could get their hands on. Declan McGurk of Speciality Brands talked us through a story full of river rafts, bribes, disguises, late night drop points and extremely dangerous encounters with men with big guns. Soon word of John’s Oaxacan spirit spread and demand began to grow. John’s spirit is named Ilegal as a tribute to the artisan producers who continued to create the spirit in the traditional manner throughout times of severe restrictions and outright prohibition. Nose: Predominantly savory nose with a slight sweetness, pepper and smoke. 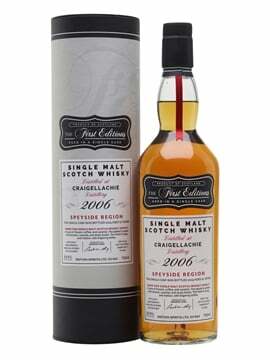 Palate: Remarkably complex for an unaged spirit, eucalyptus, soft fruit and caramel, herbs and pepper, light smokey finish. Nose: Chocolate orange, vanilla, citrus and slight smoke, berries. 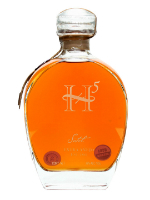 Palate: Smoothly opens up to oak, vanilla, butterscotch and caramel, orange, herbal notes. Earthy smoke finish. Finally, Jenny Beardshall from London’s smart new mezcal bar Mezcaleria Qui Qui Ri Qui talked us through the final three Mezcals. Nose: Earthy and peppery with a hint of smoke. Palate: Warming spice, coffee, green apples, new rubber, smokey finish. Nose: Menthol, fruit, smoked meat, herbs. Palate: Sweetness opens to bonfire smoke, earth, peppery spice, alcohol well integrated at almost 49%. Nose: Green bananas, light notes of sweet tropical fruit, terracotta, plant pots, fresh timber …basically Homebase. Palate: Big tangy spice opening up smoke, timber and bonfires but with a sweet citrus undercurrent. However overshadowed Mezcal may be by Tequila, I believe that it won’t be long until it will be appreciated as a great spirit in its own right. 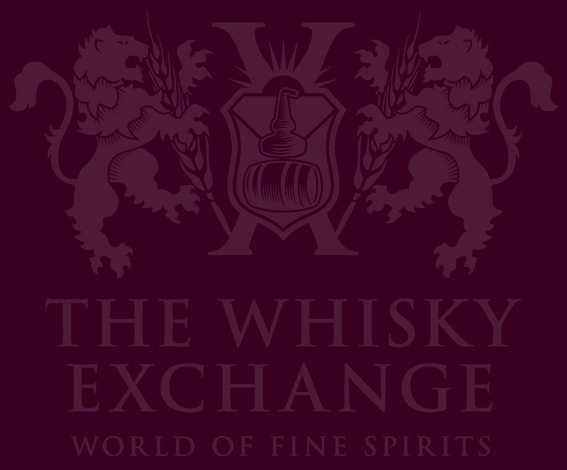 Handcrafted; an art form; an artisanal product concocted by families and passed down through generations; a diverse range of flavours, aromas, mixing opportunities and, above all, a real feel good factor when you drink it. So if you’re not doing anything next Cinco de Mayo, why not get some friends together with a bowl of tortilla chips and explore the wonders of this complex and uplifting spirit.